75th and Sedgwick: Ooh Oh-Oh...The Sweetest Thing! What a beautiful post! I love how colorful all of that embroidery is. And I think I might need some embroidered sushi in my life. Just sayin'. As with most crafts, once you teach yourself can you teach me? Gee, thanks! So, D, this post is all about delicious sweets. I know, I just posted about the ice cream sandwiches, but still. It's summertime! Ok, so a while back I posted about what I claim as my favorite all time dessert that I have ever had a restaurant. That's right, the caramel popcorn sundae at ABC Kitchen was made for me. Well, you can imagine my excitement when it was featured on one of my favorite blog series:"Currently Snacking On" from Oh Joy! It was then and there that I decided "Currently Snacking On" is something I should be paying even more attention to! 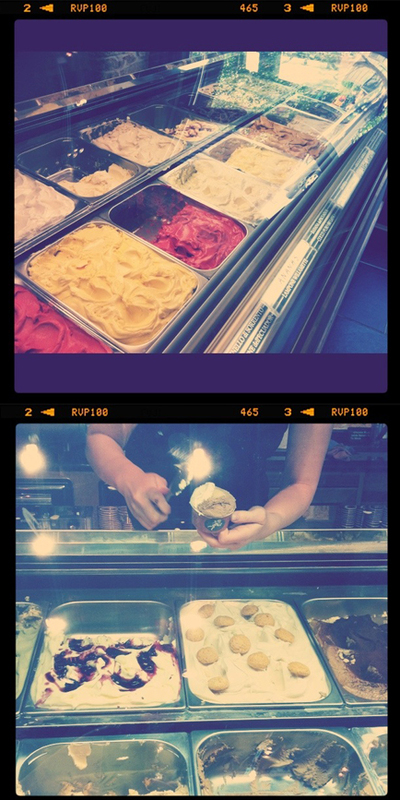 So when I saw this post about Amorino, a European gelato place that recently opened in NYC, I was immediately intrigued. 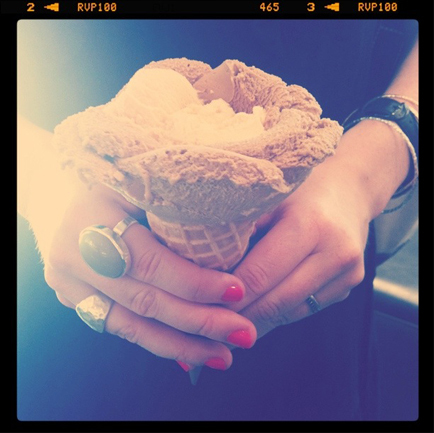 You might remember that I proclaimed my love for gelato on this blog way back when. They even have my old favorite flavor: Crema Caramel! But oddly I tried it and didn't love it as much as I did back in Rome when I studying abroad. Anyway, this was totally a self-serving post to simply gush about yummy eats and to play with Instagram. What are you up to this weekend? Nick and I are finally seeing Bridesmaids and will be working on getting the living room ready for the shower next weekend! PS: These photos melt my heart. HAPPY FATHER'S DAY, DAD! PPS: I had to put down Chelsea Handler. I thought she would be funnier to read than she is on TV, but alas, I just wasn't laughing with her. I know that might upset some folks, but I promise it isn't because of the redhead part. I promise! I still need funny right now though, so I went directly to what I know works every time: Mr. Sedaris. I have to stop myself from getting on the bus and coming up every time you post desserts!!!!! YUM! Love the pictures too - especially the bridesmaid gelato pose! Yummy! Reminds me of Roma! Ladies it really was so, so good. I've gotta go back -- preferably when each of you are in town! Also, yum, I'd love to try Seasons 52 when we are MD next! You know I LOVE pecan pie! !